On December 1 2012 we’ll do a brief presentation of the Sunshine Socialist Cinema and screen the film Stalin by Picasso or Portrait of Woman with Moustache by Lene Berg during the Socialist Forum 2012 in Stockholm. The screening takes place at 15.45 in the ABF house at Sveavägen 41. In 1953 Joseph Stalin died. Pablo Picasso was asked to draw a portrait of Stalin for a commemorative issue of the French Communist weekly Les Lettres françaises, which was edited by Louis Aragon, a friend of Picasso. The drawing provoked strong reactions from the French Communist Party, and the party’s Central Committee published a condemnation of both Picasso and Aragon on the front-page of the daily L’Humanité. The major criticism of the portrait was that the style in which it was drawn did not do justice to “the moral, spiritual, and intellectual personality of Stalin”. 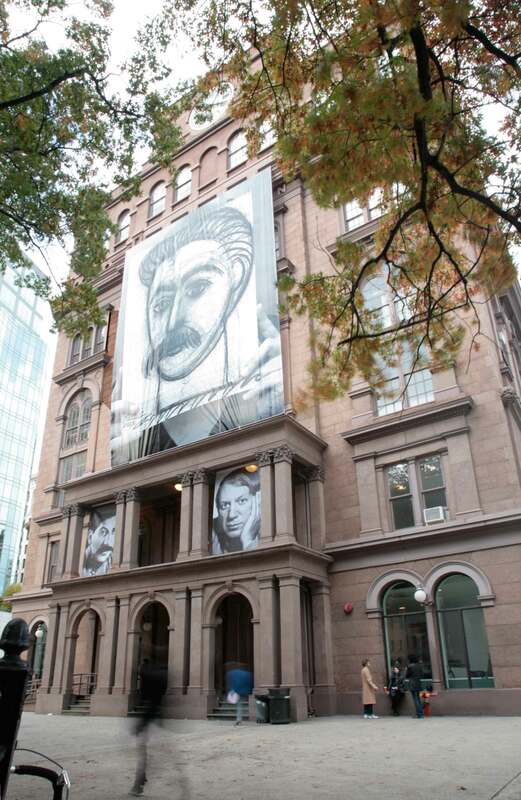 “Stalin by Picasso or Portrait of Woman with Moustache consists of a video, a book and three façade-banners. The project deals with the so-called ‘Portrait Scandal’, or `L’affaire du Portrait`, which later has been named the first consequence of Joseph Stalin’s death in 1953. It centers around two great, short men and a drawing that created strong reactions. On one level, it is about how two icons from the 20th Century, Stalin and Picasso, once were perceived and how much their public personas have changed since then. On another level, it is about art and artistic freedom, or un-freedom, and of ways of reading and using images, particularly images of so-called great men. But perhaps the most interesting aspect of this anecdote from the beginning of the Cold War, is how one simple charcoal drawing can initiate so many feelings, discussions and intrigues as this one did – both in 1953, and in 2008.
particular, in this case Joseph Stalin. Seemingly these are thoughts from a distant past. But the project proved to be less nostalgic than expected when the party-secretary of the governing Norwegian Labor-party unexpectedly withdrew the permission to use the façade of the People’s Theatre Building in Oslo for the public part of the project, a permission that had been granted by the board of the building some months before.This attitude was later more or less repeated when I was invited to show the project at Cooper Union in New York in October 2008. After two days of a planned 6 weeks show, the three façadebanners were taken down from the façade without a warning and without discussing it neither with me nor with the curator before hand. In 1953 one of the problems with Picassos drawing was that it was considered bad propaganda for Stalin and thus for the communist cause. 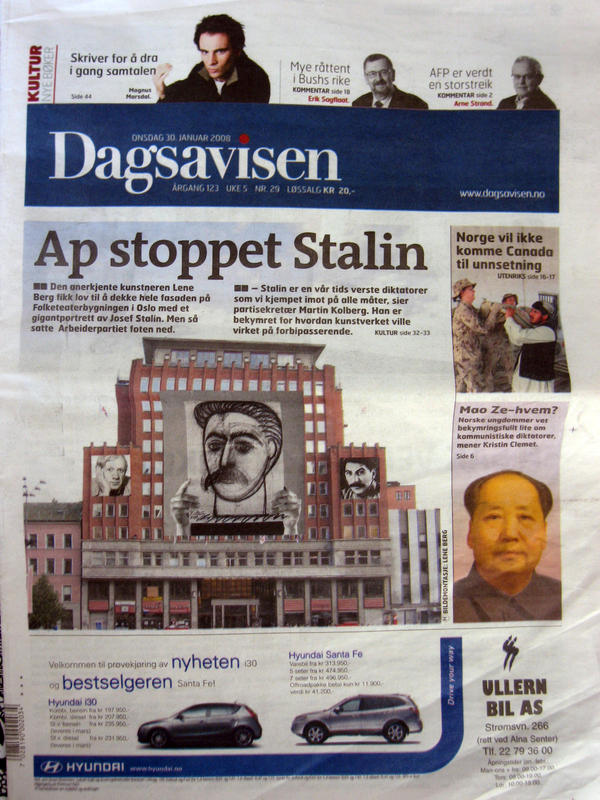 In 2008 one of the problems was that the façade-banners were not clear publicity, and that some people found it unacceptable that the project did not express a clear critique of Joseph Stalin. The Sunshine Socialist Cinema will be sharing the stage with artist Nina Svensson and writer Margareta Ståhl, who’ll be presenting a graphics portfolio made by Albin Amelin and Ruben Blomqvist in 1933, Humanitet, with images protesting against the rise of fascism. We’ll look at similarities and differences in how a political work of art can be constituted and distributed. The Socialist Forum takes place between 10-18 on December 1 2012 in the ABF house at Sveavägen 41. The program includes talks, presentations, discussions, debates and recitations by people like Nina Björk, Stina Oscarsson, Kajsa Ekis Ekman, Liv Strömqvist, Stefan Jonsson, Mattias Gardell, Jenny Wrangborg, Guy Standing, Ann Ighe, Anna-Klara Bratt, and a hundred more. The full program for the Socialist Forum 2012 can be found here. 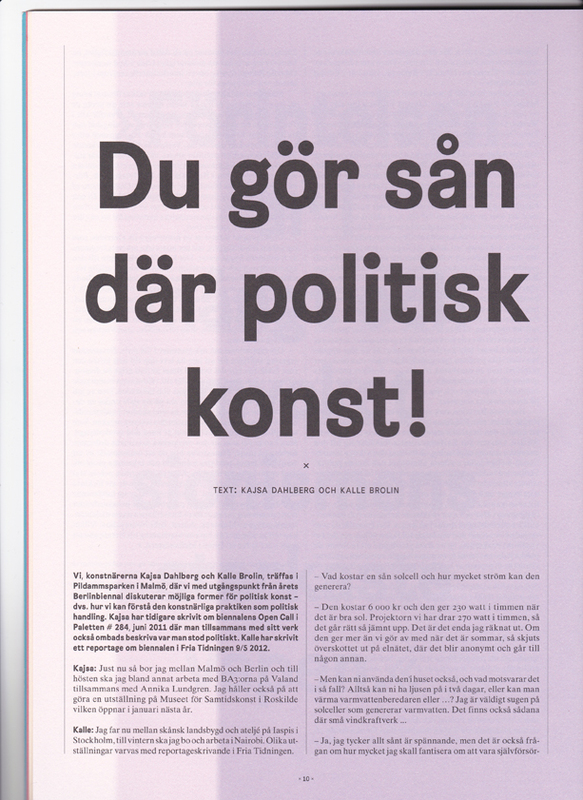 An article in the latest issue of Swedish art magazine Paletten has Kalle Brolin and Kajsa Dahlberg talking about art and politics. 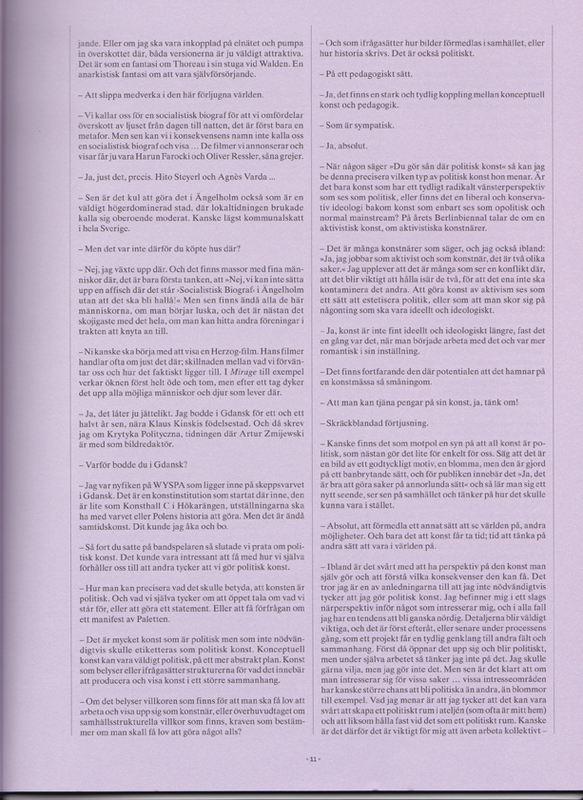 The first couple of paragraphs deal with the Sunshine Socialist Cinema, where Kalle works, giving readers a very basic introduction. From no. 3:2012 – # 289. During the symposium CIRCULAR GROUNDS #1 the Sunshine Socialist Cinema will introduce a couple of clips from Kuxa Kanema newsreels, recorded in Mozambique in the mid 1970’s. Kuxa Kanema means “Birth of Cinema”. When Mozambique gained independence in 1975 after nearly 500 years of colonial rule, the Marxist FRELIMO party and the president Samora Machel founded the National Institute of Cinema in order to produce and distribute images of the country re-building itself into an independent nation. The 10 minute Kuxa Kanema newsreels were screened weekly in cinemas and through mobile screening units transported around the country in old VW buses. The people working on these newsreels were all novices, educated by foreign filmmakers invited by FRELIMO from Yugoslavia, Cuba, Brazil and the Soviet Union. Jean-Luc Godard attempted to help set up a national television system, teaching people in rural villages to film using video cameras. The anthropologist Jean Rouch set up documentary filmmaking workshops which shot so-called Cartes Postales every morning on 8 mm and then screened them the same evening, in the first instance of what became known as Varan Workshops. Postcards on film, of the people, by the people, and presented to the people. In Kuxa Kanema, film was meant to be an educational tool used to create an independent Marxist state. Its’ example has inspired several contemporary artists to comment upon it. Kuxa Kanema speaks of jilted idealism and of conflicting desires, of a wish for art to get to play a part in the construction of a new society.